Stretch film and shrink wrap are a commonly used packaging materials used in industries to secure items to a pallet or crate. Industrial film and shrink wrap provide important protection of goods and binds them to a pallet or crate for safe transportation or storage by keeping the items tightly bound and protected from the elements. Most film and shrink wrap is composed of polyethylene and PVC. 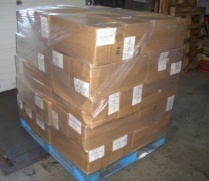 By wrapping many layers of these materials to an object to be placed on a pallet, they offer secure holding. The film/wrap can be wrapped automatically or semi-automatically using specialized machinery or it can be wrapped manually. The film is pliable, thin and sticks to itself, so there is no hassle in trying to knot, glue or staple it closed. But because they are used in the industry, the sheets of stretch film and shrink wrap used with machinery are much longer and wider, and depending on the size of the goods to be wrapped, the sometimes require specialized machinery to get it around the object and the pallet. They can be ordered according to the manufacturers/suppliers sizes in mm or yards. Not only is this material used in the transportation of objects and goods, it is also widely used to protect them in storage facilities such as warehouses. One of the advantages of using stretch film is that it is not a very expensive protective material and can be used on all kinds of materials. It can be used on machinery, chemicals and furniture. We have a wide selection of stretch film for all your business needs, so please feel free to contact us today to learn more about our polyethylene products.